Can someone please tell me what it is about Disney and amusement park rides? Who would have thought that an amusement park ride could actually make a good movie, and vice versa? The first of these strange films that I have seen is Pirates of the Caribbean, which is actually an incredible movie…clearly it was only loosely based on the ride. 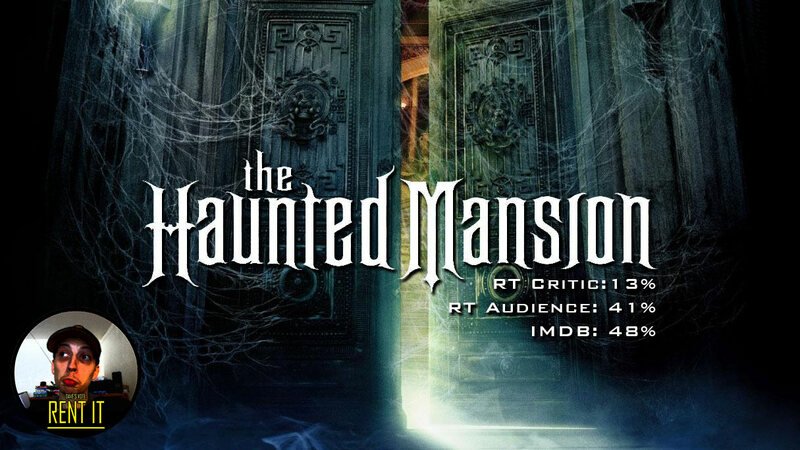 The same year, another ride movie was released entitled The Haunted Mansion. While this film may not be as epic as Pirates, but it has a great cast, some great one-liners by Eddie Murphy, and a semi-stereotypical story that will be sure to have people laughing. Eddie Murphy stars in this comedy as Jim Evers, a realtor willing to stop at nothing to sell the most challenging of cases available. His wife is also a realtor, and the two of them work as a team. When a mansion comes-a-calling, Jim wants in on the deal, but the butler of the house expressly told them that only his wife was allowed to come, that she has a trusted face. Anyway, Jim packs up their kids, Michael and Megan into the car and they all head to the mansion to help out in any way they can. Once there, they start to notice all of the creepy haunted things start going bump in the night, and what kind of hidden agenda all of the ghouls and ghosts have towards Jim’s wife. Spooky. First of all, how unprofessional are these people, anyway? I know it’s a kids movie and all, but bringing your kids with you to work, this kind of work, is unprofessional. Also, going against the seller’s wishes and bringing your husband is such a terrible move. Anyway…I know, it doesn’t matter, it just stuck out at me a little. Next, I don’t know if the movie was ever attempting to scare or deliver an impending feeling of doom for the audience, but it just didn’t come off as danger. You know it’s Disney, you know that these people are cracking jokes left and right, so you must know no harm will come to them…so I guess it’s predictable. What it did have a good amount of – is humor. Eddie Murphy makes the movie what it is. He is hysterical and has tons of memorable one-liners. The movie is a decade old, and even I still remembered plenty of the lines spoken in the movie. The story…I didn’t remember, but a lot of Eddie Murphy’s lines I did. Some people hate the fact that Murphy decided to go almost all children-related movies after a streak of great “adult” roles stemming from SNL to Beverly Hills Cop, but I think he really adds to the movie, and who can resist that great big smile of his? What I was a little iffy on in this film was the foul language that just didn’t seem to belong. I believe this was around the time where the Disney name was beginning to test the idea of using foul language in their films. While watching this, there were instances where you know for a fact that they did not even need to use the language. You know it’s a kids movie already, it doesn’t feel like anything else, so using language not found in a kids movie just feels weird. It feels awkward. There is no reason why a parent can’t watch this film with their young kids during Halloween time…except the language. Because of that, the movie almost feels like it has no place…or target audience. That is an unfortunate major downfall. Who should watch this are families that really don’t care about a language filter. It probably is not the best for kids, but someone needs to be able to enjoy the movie fully, which doesn’t seem possible at this point. So in the long run, the movie is pretty funny in quite a few parts, has a pretty good cast, it just doesn’t have a target audience. Take that however you want it.